Adrian Nakic/The Image Bank/Getty Images. Activity trackers like the Fitbit (as well as countless others) were primarily designed to track physical activity. That makes sense because regular physical activity is beneficial for cardiovascular fitness, cholesterol, blood glucose, blood pressure, weight management, mental health, and cancer prevention. However, an emerging body of evidence is shedding light on how the opposite end of the spectrum—physical inactivity or sedentary behavior—is also an important aspect of health. Namely, the more time you spend being sedentary (sitting, watching TV), the more likely that you'll suffer serious health consequences. The simple explanation is that people who sit more tend to exercise less, and thus have worse health outcomes. But the reality is not so simple. Even if you exercise an hour a day, spending the rest of the day sitting in a chair is still bad for your health. In fact, a recent analysis of multiple studies demonstrated that adults who spend more time in sedentary behavior are at greater risk for type 2 diabetes, cancer, cardiovascular disease, and early death--regardless of time spent exercising. While the harmful effect of sedentary time was somewhat lower in people who were more physically active, sedentary behavior remained a significant predictor of poor health outcomes independent of physical activity levels. So even if you exercise regularly, it's important to avoid too much sedentary time. The obvious solution is to just get up and move. But that's easier said than done. Here are some tools to help. Here is a great overview of devices and apps which alert you when you have been sitting for too long. You can set the inactivity interval (e.g. 15 minutes) as well as the hours during the day you want the alert to be active. If you spend much of your sitting time in front of a computer, use an online timer to remind yourself to get up and walk every 15 to 20 minutes. This simple timer or this fancy timer with customizable fonts and alerts. Other options are to use your smartphone timer, wristwatch, or even a kitchen timer. One study, for example, showed that a mobile application that nudged office workers to get up from their desks had good results. The application, called SitCoach, provided persuasive messages and encouraged active breaks. It achieved a significant decrease in computer activity among the participants. Better yet, if you can manage to work and exercise at the same time, then use a treadmill desk. Watching TV or streaming video doesn't have to be a sedentary activity. Do a few push-ups or body-weight squats every 15 minutes or during commercial breaks. You could also invest in a posture coach, such as Lumo Lift, that vibrates when you start slouching at your computer. This might indicate it is time to get up and stretch a bit. 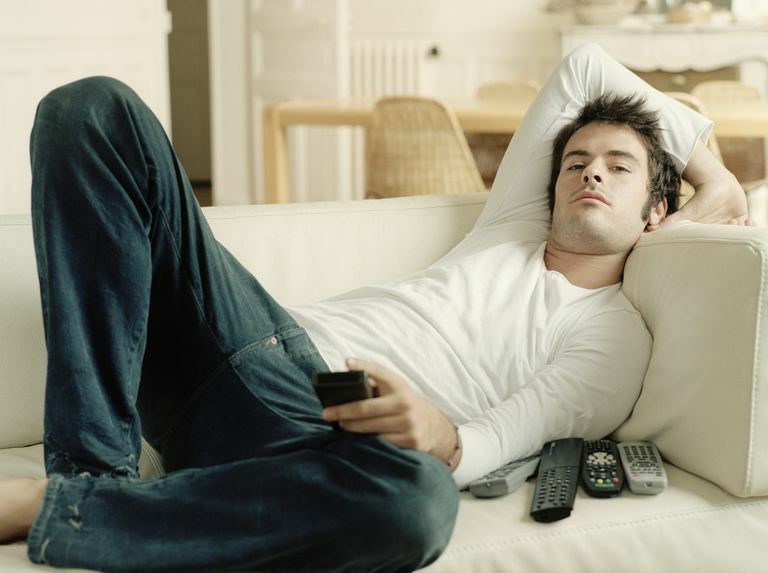 Humans are not designed to sit, but modern life makes it too easy to be a couch potato. The key point is to not only do regular exercise but also minimize the time you spend sitting. While there are many devices that can monitor your activity, self-monitoring of sedentary time has not been that well covered yet. Also, an analysis of mHealth technologies aimed at physical activity and sedentary behavior, conducted by a research team from the University of Auckland and the Technical University of Lisbon, showed that current mHealth interventions have little effect on the two. They do, however, make interventions more comprehensive and interactive, so more improvements are expected in the future. Another study, led by Aoife Stephenson from the Ulster University in Northern Ireland, showed that mobile and wearable technologies can reduce sedentary behavior, however, the effect is often short-lived, therefore, we might need to learn more about effective behavior change techniques. Biswas A, Oh PI, Faulkner GE, Bajaj RR et al. Sedentary Time and Its Association With Risk for Disease Incidence, Mortality, and Hospitalization in Adults: A Systematic Review and Meta-analysis. Ann Intern Med. 2015 Jan 20;162(2):123-32. Dantzig S, Geleijnse G, Halteren A. Toward a persuasive mobile application to reduce sedentary behavior. Pers Ubiquit Comput. 2013;(6):1237-1246. Direito A, Carraça E, Rawstorn J, Whittaker R, Maddison R. mHealth Technologies to Influence Physical Activity and Sedentary Behaviors: Behavior Change Techniques, Systematic Review and Meta-Analysis of Randomized Controlled Trials. Ann Behav Med. 2017;51(2):226-239. Sanders J, Loveday A, Esliger D, et al. Devices for Self-Monitoring Sedentary Time or Physical Activity: A Scoping Review. J Med Internet Res.2016;18(5): e90. Stephenson A, McDonough S, Murphy M, Nugent C, Mair J. Using computer, mobile and wearable technology enhanced interventions to reduce sedentary behaviour: a systematic review and meta-analysis. Int J Behav Nutr Phys Act.2017;14(1):105-121.